It seems that Londonist has found its true calling - as a slightly less scary version of Mystic Meg! Yesterday, we predicted that more scandals were sure to follow in the Lib Dem leadership contest, and we were right! 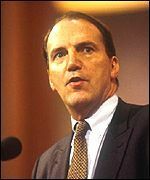 Today, it has been revealed that Simon Hughes, yesterday the favourite to become the party leader, has come out as bi-sexual. Apparently, the Taxi-driving M.P. has had both homosexual and heterosexual relationships, and has made calls to a gay chat line. "So what?" we hear you cry! Well, it means that Hughes has lied on several occasions about his sexuality. There have been rumours flying around that he is gay ever since he became an M.P., which he has denied on several occasions. Hughes' hand was forced, however. The News of The World, the delightful tabloid behind the 'Fake Sheikh' sting on Sven, and the Mark Oaten rent boy revelations, threatened to publicly out Hughes unless he came clean. But it does not take a genious to work out that his sole sexual attraction is not to women, as he is in his fifties, unmarried, and has been spotted out many times at many of London's gay clubs. The question here, though, is not whether a gay man can lead a political party (this is the 21st century, for crying out loud! Hughes is no less able to lead his party if he is gay, bi, or straight.) but whether what goes on in the bedroom of any person in the public eye is any business of the press, or indeed the public. Whilst the Mark Oaten scandal is somewhat more serious (he DID betray his wife, after all), Hughes bears no bones about being a bachelor. Surely the fact that Hughes is a dull windbag has more bearing on his ability as a potential party leader than his sexuality. Londonist weeps for the Lib Dems if he loses the leadership election purely because he is bisexual.